Intex Cloud Y5 latest budget dual core smartphone from the company. It is successor to recently launched Y2 . The device comes with 1GHZ dual core processor and it runs on Android 4.0 ICS OS . It has 4.5inch capacitive touch screen display with resolution of 480x854pixels(WVGA). Intex Y5 is dual SIM(2G+2G) phone with dual standby. The Cloud Y5 has 3.2 MP rear camera with LED flash and 0.3 MP (VGA) front-facing camera. Aqua I-4 was launched along with Intex Y5 that packs with 8MP auto focus rear camera with LED flash. The handset offers 2G (EDGE), Bluetooth, WiFi, 3.5mm audio jack, FM Radio and micro USB connectivity. It is available at affordable price , Rs.6190. Micromax Canvas Bolt A67 , Xolo A500 are the main rivals ( vs ) of the handset . Till now the company has not revealed any details about RAM , ROM ( internal memory) and battery . The mobile phone does not features 3G connectivity , that might disappoint you . 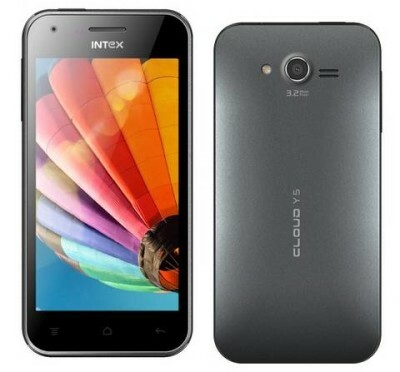 Intex Cloud Y5 will be available in White and Black color .